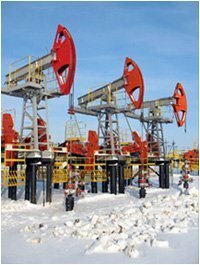 Cryogenic Grease | Low Temperature Grease | Superior Industries, Inc. If you’re looking for the most versatile, high performance low temperature grease on the market, look no further. This top quality, multi-purpose, low temperature synthetic grease is specifically designed for use in extreme cold, such as winter weather, polar or cryogenic conditions. We recommend this waterproof, odorless grease for use in a wide variety of low temp applications including: construction and surveying, freezer cards, cold room conveyors, freeze drying equipment, liquid nitrogen applications, packaging plants, and oil and gas production. 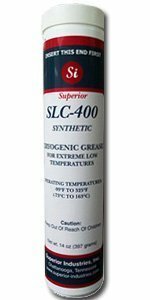 SLC-400 actively lubricates and protects equipment even in sub-zero or polar temperatures. This synthetic low temperature grease functions at temperatures well below what conventional greases can withstand, braving cold to -100°F (-73°C). Even in sub-zero operating conditions SLC-400 can be effectively applied to cams, valves, slides, and other operating equipment using standard grease guns, pumps, or dispensers. This one-of-a-kind low temperature grease maintains its viscosity despite heating and cooling cycles or abrupt temperature spikes—it remains highly effective to 325°F (163° C). SLC-400 is a great choice for packaging or manufacturing plants where equipment returns to normal room temperature after freezing or cooling. 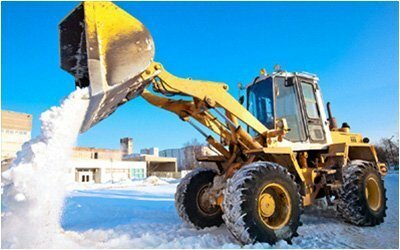 For construction or other outdoor equipment, don’t allow winter weather to catch you unprepared: plan ahead and apply SLC-400 before temperatures plunge machinery into hazardous low temperatures. Versatile Applications Our multi-purpose cryogenic (low temp) grease has outstanding versatility for plant-wide care and keeping of metal, rubber, and plastic equipment. This extreme low temperature grease can be applied to bearings, cams, slides, linkages, valves, conveyors, couplings, latches, and many more moving or static parts. SLC-400 is an odorless, workable grease and has proven itself an incredibly durable solution for lubricating lever mechanisms and conveyor and hangar assemblies. It is also a popular choice for freeze drying equipment, cold storage, ice plants, aircraft, and coffee processors to prevent premature wear or breakdown of equipment. 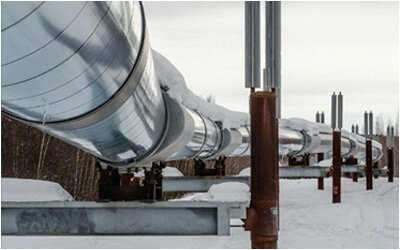 SLC-400 combines the highest quality low-viscosity base oil and synthetic thickener for extreme low temperatures to ensure the best possible performance in sub-zero weather. Our base fluid is widely recognized as the top performing base oil in the industry for its pourability and strong oxidative properties at temperatures (below -20°). This odorless amber grease maintains excellent viscosity stability in temperatures from -100 to 325oF (-73 to 163°). The superior quality and long life of SLC-400 increases the intervals between grease applications, no matter the weather. This synthetic low temperature grease provides the best protection for valuable equipment to prevent damage before it starts. SLC-400 features a low pour point coupled with high viscosity, for pourable, easy-to-apply grease that maintains the appropriate tackiness and thickness to protect metal, rubber, or plastic. In addition to the necessary viscosity stability, SLC-400 demonstrates low volatility and strong oxidative properties for a highly stable grease that continues to effectively and efficiently coat and defend equipment in unforgiving temperatures. Suitable for Liquid NitrogenSLC-400 can also be utilized on equipment exposed to liquid nitrogen, used for “quick freezing” food products and biological samples. 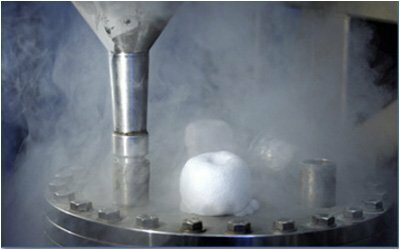 The freeze drying process requires any lubricant to function properly in extreme cold and at room temperature once the freezing cycle has been completed. This grease’s viscosity stability makes it the lubricant of choice for liquid nitrogen, cryogenic, and even liquid oxygen plant applications. Water and Wear Resistant Choose SLC-400 for a tenacious low temperature grease that resists water washout and protects metal from exposure to moisture and the resulting rust and corrosion. This synthetic cryogenic grease guards metal, plastic, and rubber from ice, moisture, inclement weather, water runoff, and washdowns. 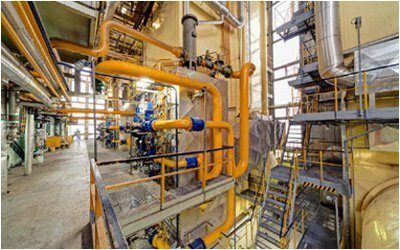 SLC-400’s tackiness, high film strength, and synthetic metal compounding also make it extremely effective at preventing wear caused by high operating pressures. SLC-400 can easily handle heavy load conditions—such as loads normal to construction equipment— as well as shock and constant pounding.